Sophisticated investors around the world move billions of dollars every day on advice from Wall Street research analysts. But are these analysts really as talented at stock-picking as retail investors would like to believe? The numbers say otherwise. NerdWallet investigated the spectrum of analyst stock ratings of the Dow 30 throughout 2012 to uncover these surprises when it comes to analysts’ stock recommendations. Only 51% of all analyst ratings on the Dow 30 over calendar year 2012 were correct. 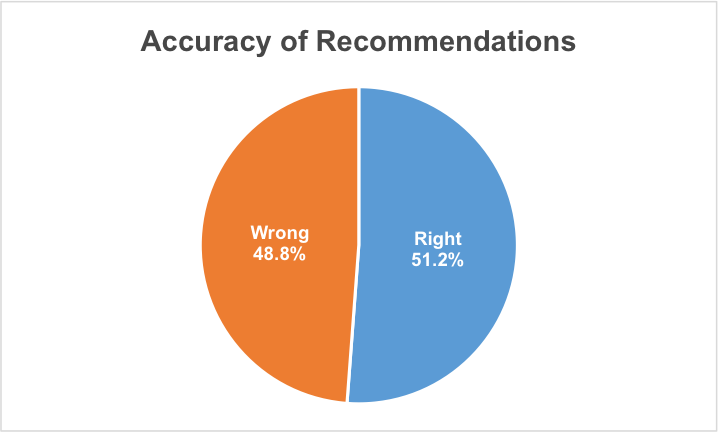 Analyst recommendations and research reports from 2012 were categorized as either buy, sell, and hold ratings – a full 49% of these ratings turned out to be wrong. The average analyst portfolio just slightly beat the market: While the distribution of ratings was highly skewed, allocating a portfolio proportional to analyst ratings would have outperformed the Dow by 4.1%. Research analysts may not be above average in pure accuracy, but the winners they pick tend to win big. Analysts are better at identifying winners: With over 70% of buy ratings correct, buys made up about 85% of all accurate ratings. Hold ratings performed worst, with only 20% of them playing out as expected. Study after study has shown that most casual investors would be far better off buying and holding low cost mutual funds and ETFs, rather than trying to pick individual stocks they think can beat the market. Instead of following the unreliable guidance of these supposed experts on a one off basis, casual investors should consider doing a full comparison of all available funds instead. The takeaway? Since even most professionals can’t reliably pick stocks, the truth is that most likely neither can you, the individual investor. Here’s how the analyst estimates broke down in 2012. With research playing such an important role in the investing world, NerdWallet studied Wall Street analyst recommendations on the 30 stocks in the Dow Jones Industrial Average over 2012. 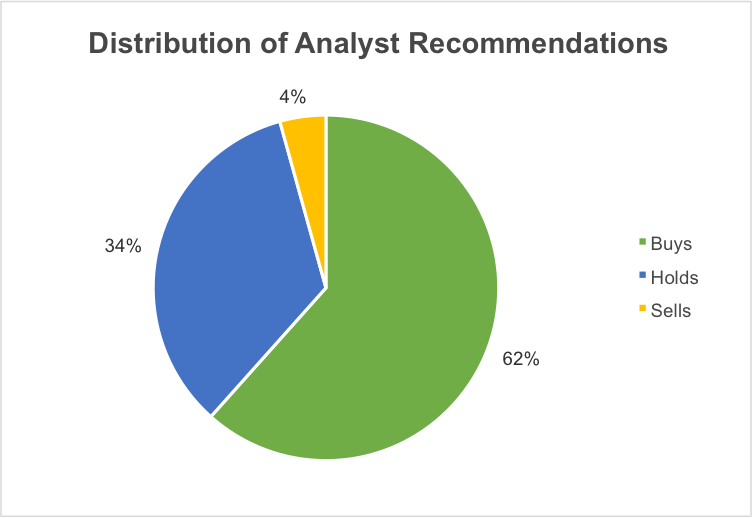 All recommendations are the latest issued prior to January 1, 2012 (data sourced from Bloomberg). By comparing recommendations to stock performance over calendar year 2012, we found that only 51% of ratings were actually correct and the distribution of ratings was highly skewed, but allocating a portfolio proportional to analyst ratings would have outperformed the Dow by 4.1%. Not considering the magnitude of returns just yet, this is little better than taking a blind guess at the direction of any given stock over the next year. This initial finding doesn’t inspire much confidence in analyst ratings. 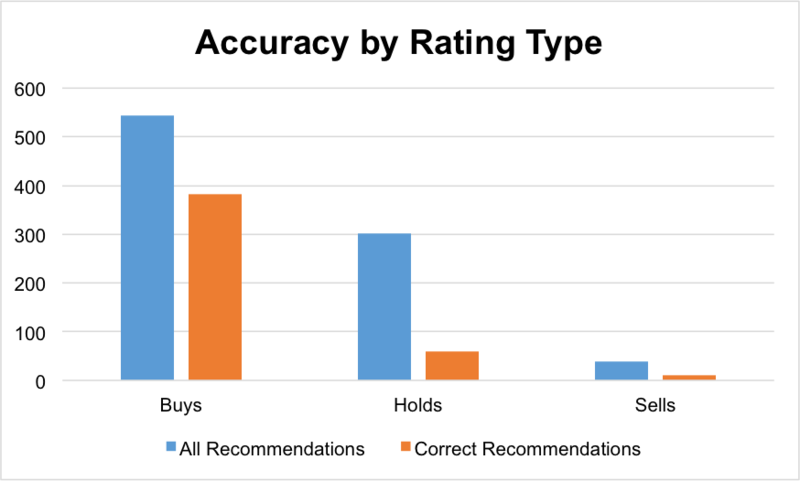 Breaking the recommendations down into separate buy, sell, and hold ratings, we found even more reason to think before taking research reports at face value. On average, you would expect about half of stocks to outperform the index and the other half to underperform. The distribution of analyst ratings fails to reflect this, especially where sell ratings are concerned. However, what we don’t know is whether this is a perpetuation of improper influence of the private side of investment banks over public divisions or simply human bias towards the optimistic. With over 70% of buy ratings correct, buys made up about 85% of all accurate ratings. Hold ratings, on the other hand, performed horrendously with only 20% of them playing out as expected (defined as returning with 2% of the market index). The performance of sell ratings was difficult to judge given the small number of them (38 sell ratings out of 883 total). What does this mean for us when trying to interpret an analyst rating on a stock? Research analysts seem to be much better at picking winners. This suggests that we should put more weight on a stock with a solid proportion of buy ratings. However, hold and sell ratings are more or less useless in terms of predictive power. A stock with a large number of hold ratings is likely to be one that analysts are simply unable to understand or forecast. This is a situation where a casual investor might want to avoid, but a seasoned value investor might want to target. While accuracy of stock picks is important, many successful investors achieve an accuracy ratio of less than 50% but have much bigger winners than losers. This makes it possible for a below-average accuracy to result in an above-average return. To test if this was the case with analyst research, NerdWallet constructed a hypothetical portfolio that was allocated evenly across the 30 stocks in the Dow but proportional to the split of buy, hold, and sell ratings for each one. Over 2012, this portfolio outperformed the Dow by 4.1%. This encouraging return suggests that research analysts may not be above average in pure accuracy, but the winners they pick tend to win big. An Equity Research Primer: Who Are These Analysts? Research analysts are employed primarily by large investment banks to cover a set of companies and issue buy, sell, or hold recommendations periodically. A buy rating suggests that the stock will outperform the relevant market index, whereas a sell rating would indicate potential underperformance. A hold rating then implies performance similar to the market (defined as within a 2% return window in either direction for this study). Each recommendation is typically issued with a target price that has a one-year time horizon. Analysts’ reports are purchased by mostly by investment managers and hedge funds. In the early 2000’s, ten of the largest investment banks at the time were found to have encouraged analysts to publish dishonest reports for the benefit of the bank. Specifically, a research analyst might be encouraged or forced to publish a false “buy” rating for a company that the advisory side of the bank was seeking to do business with. As you can imagine, this practice resulted in hundreds if not thousands of false ratings that misled investors. The SEC reached a settlement of $1.4 billion with the banks in 2003 and the Sarbanes-Oxley Act enforced the placement of a “Chinese Wall” between the private advisory side (the investment banking division) and the public side (sales, trading, and research). Since then, research reports have been regarded as being less biased, though many third-parties are convinced that there is still an implicit understanding between research analysts and investment bankers in large banks. Nonetheless, investors today still use research reports to support their investment analysis. As an individual investor, you have several reasons to feel encouraged. First, even professionals who dedicate their careers to knowing everything about the markets and their stocks are generally unable to beat the odds of picking stocks. As long as you aren’t behaving irrationally, your accuracy doesn’t have to stray much from 51%. Second, even with relatively mediocre accuracy, you can outperform the market. This study proves that you don’t need to call every stock correctly to beat the market – you do have to hit a few big winners though. Given that 88% of hedge funds underperformed the market in 2012, a 4.1% outperformance sounds pretty good. Third, while most people are not institutional investors with access to expensive research reports, it doesn’t cost money to learn a valuable lesson about buy-and-hold investing from the example of research analysts. The bottom line – you don’t need perfect judgment to earn a solid return. NerdWallet studied Wall Street analyst recommendations on the 30 stocks in the Dow Jones Industrial Average over 2012. All recommendations are the latest issued prior to January 1, 2012. All data was sourced from Bloomberg. For the second part of the study NerdWallet constructed a hypothetical portfolio that was allocated evenly across the 30 stocks in the Dow but proportional to the split of buy, hold, and sell ratings for each one. The portfolio was allocated proportional to the ratings. For example, if a stock had 50% buy, 40% hold, and 10% sell, the 1/30 of the portfolio would be allocated proportionately (50% long, 40% cash, and 10% short) for a net long position of 40%. Analysis by Jonathan Hwa, Guest Contributor. Stock market image courtesy of Songquan Deng, Shutterstock.com.